Wrench wants to take the hassle out of car repair. 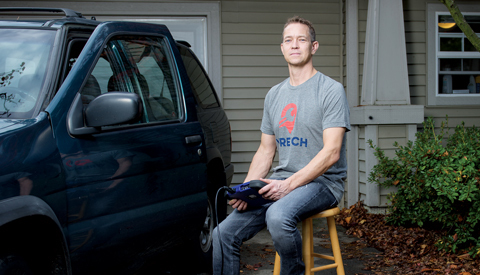 John Vicory PICTURED: Wrench CEO Ed Petersen hates dropping off his car for repairs. To request service, customers can visit Wrench’s website — getwrench.com — or they can use a smartphone app. Its most popular service is an oil change, which starts at $68. Wrench also offers memberships, which include quarterly visits for oil changes, tire rotations, safety inspections and fluid top-offs; memberships cost $14.95 a month for cars and $19.95 for trucks. Last June, the Madrona Venture Group contributed half of a $1.2 million seed round. Managing Director Len Jordan says the big market potential, clear pain point and compelling solution sold Madrona on Wrench’s concept. So far, Wrench has serviced more than a thousand vehicles. Jordan says the startup is still in its infancy, so the focus is less on making a profit and more on establishing a presence. Demand, however, is apparent. Wrench expanded to car-happy Phoenix in November and is studiously eyeing other markets. Wrench has a contract to service vehicles for Lyft, the ride-hiring service. And it hopes to expand its services to office and industrial parks; it already has deals with Bellefield Office Park in Bellevue and North Creek Business Park in Bothell.